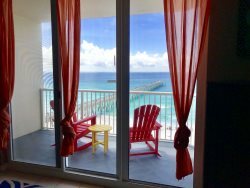 Navarre Beach is more than what meets the eye. Just below the surface of the Gulf of Mexico and Santa Rosa Sound is another world waiting to be explored. Navarre Beach Marine Sancutary and Artificial Reefs, part of the Navarre Beach Marine Park, gives even novice snorkelers and divers an opportunity to encounter sea turtles and other species. Near-shore reefs allow exploration in the gulf and in the protected waters of the sound. Waverunners Perfect for partnering up, Navarre Family Watersports offers Yamaha WaveRunners that will put a smile on your face all day long. Pontoon Boats Perfect for a family day on the water, Navarre Family Watersports offers beautiful pontoon boats with quiet four-stroke motors that include a Bimini top that covers 1/2 the boat. Helicopter Rides Experience the beauty of Florida`s beaches from a spectacular perspective. Take a jaws tour or just a buzz down the white sugary sands of Navarre Beach. WIBIT WATERPARK!! Come have an awesome day on the water with our new Wibit WaterPark Adventure. This is a very exciting attraction and kids young and old will have a blast with our team. Parents are encouraged to interact and watch your kids have a great time. Guaranteed fun and when the evening rolls around everyone will sleep well!